As you may remember from my last post we were heading down to South Wales this weekend however that has not been possible due to a combination of my work pressures, Jake’s GCSE work pressures and me being in a lot of pain due to back problems etc. Work has been so manic recently that I have been doing additional hours and working the last two weekends and realised that all I wanted to do this weekend was sleep, read while enjoying a long soak in a bubble bath and indulge in lots of crafty behaviour. So that is what we are doing instead. There may be a little bit of gardening involved (if the back is ok) but at the moment that looks unlikely due to very wet weather. Hopefully things will quieten down a bit at work in the next couple of weeks ready for a mellow and relaxing summer ( I am very much an optomist!). It is a very lovely job and I get to work with wonderful people but there is always such a lot to do – if anyone can lend me 100 hours they are not using or can point me in the direction of a pattern to knit more time that would be most useful! 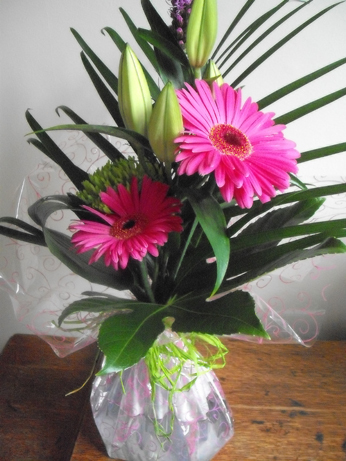 My full-time students finished their course this week and we had a lunchtime celebration – they very kindly bought me presents amongst them these beautiful flowers. 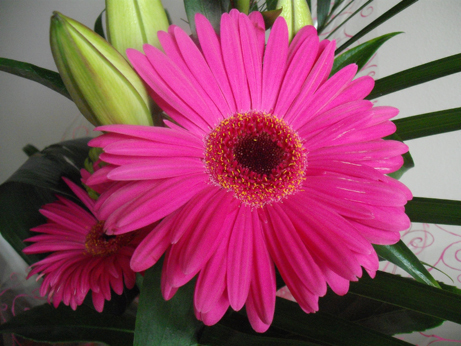 I grow lots of lilies in the garden and always have great success with them – have not tried gerberas yet. The garden is looking very lovely at the moment – the rhododendrons and azaleas are blooming along with the pirieus and the clematis are just about to start so it is all looking very colourful – so nice after the long, cold winter. 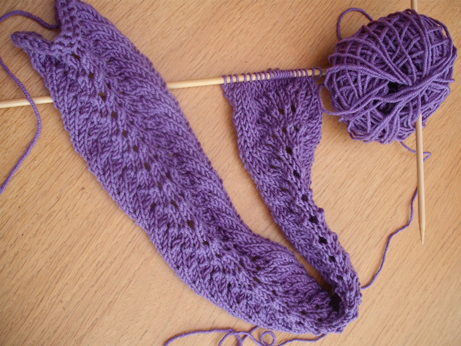 I have several knitting and stitching projects on the go at the moment – I am making very good progress with the lace scarf from the Ravelry pattern. 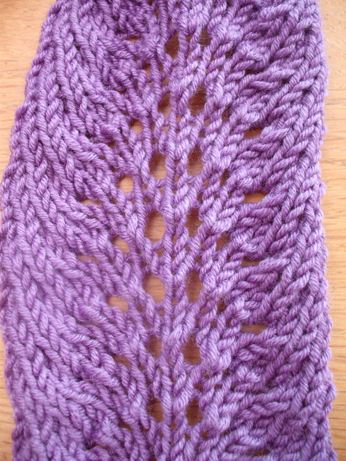 I have another lace scarf pattern lined up but in between have got some stitching to finish. I have completed the cross stitch for my next exchange – have just got the finishing into a pillow ornament to do and that one can be sent to the USA. I have just started on a Quaker motif scissor keep as a donation for Tracy at Cupcakes at Home’s fundraising raffle. Tracy is rescuing rare breed sheep so do go and visit her blog and if you can help in any way I am sure that she would be very grateful. 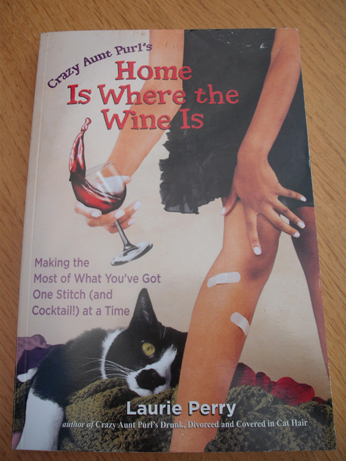 I am also planning to do lots of reading – I have just finished the second book by the wonderful Laurie Perry aka Crazy Aunt Purl – ‘Home is Where the Wine is‘. I think Laurie is fantastic – if you have never read her blog do go and visit – she will have you in stitches both with her humour and her knitting inspiration. She has done a great job of keeping me sane over the last couple of years with her inspirational writing. I hope she won’t mind me giving you a sample of why she is so my kind of woman – this is from one of her recent posts where someone suggested the idea of a lending library for yarn so that we can borrow rather than buy stash we are never going to use. Well I hope you have a really lovely weekend and that the weather improves – have optimistically suggested we have our first at home BBQ on Monday so here’s hoping for sunshine! The scarf looks like the yarn is varigated very pretty! As for the flowers, they are stunning lucky you. Enjoy your weekend.